California’s Active Transportation Program has awarded Oakland a pair of hefty grants to redesign two popular bike routes: 1) 14th Street in downtown Oakland-$10.5 million, and 2) Fruitvale Avenue west of Fruitvale BART-$5.5 million. 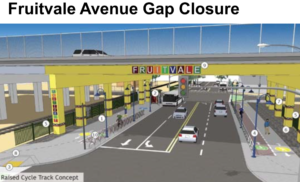 The 14th Street project will become a signature bikeway project for Oakland, connecting West Oakland and East Lake to the downtown, while the Fruitvale Avenue project upgrades an existing bike lane to Oakland’s first raised bike lanes. Both projects receive their grants starting late 2019. However, with passage of Measure KK, Bike East Bay and Walk Oakland Bike Oakland will push Oakland to build an interim bikeway sooner on 14th Street. 14th Street will be redesigned with one through travel lane in each direction for vehicles, curbside protected bike lanes with protected intersections at several locations, bus boarding islands for the AC Transit line 26, and bike traffic signals at busy cross streets. The project extends 1.7 miles from Oak Street to 980. 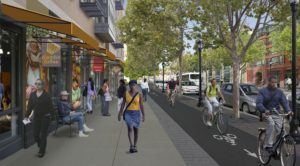 It could become a model bikeway project for Oakland and one we have been pushing for since 2013. Oakland receives more bicycling-related complaints about this street than any other. However, there will be major pushback against a road diet on 14th Street and any potential relocation of on-street parking with the project. If you bike 14th Street, look for updates next year on this project and be ready to help. Fruitvale Avenue gets a major makeover between the Estuary and E.12th Street, providing a much-improved bikeway connection to the island of Alameda. The project will have Oakland’s first raised protected bike lane (or ‘cycle track’ as it is often referred to). Gateway features are included, new street trees will be added between the raised bikeway and travel lanes, and integrated bus boarding islands built. It’s Oakland’s most ambitious and capital-intensive bikeway to date. Thanks to much input from the community, including Bike East Bay and WOBO members, we do not expect any pushback. For other East Bay cities that did not receive funding for their projects, a regional round of Active Transportation Program grants should be announced early next year. All applications that did not get state funding automatically move into the regional round of scoring. To see how your East Bay city scored at the state level for its ATP applications, go here. More details about Oakland’s ATP grant applications are included at the end of this Oakland BPAC agenda packet. I am a bit confused why we are spending money for bike lanes when I have not had our street replaced in over 13 years of owning a house in Oakland. The project does not even improve areas important to me. Funding for these two streetscape improvement projects comes from a state source of money that is dedicated to walking and bicycling improvements only. However, Oakland voters just approve Measure KK, which provides significant new funding to rebuild streets. You should start seeing a lot more streets replaced in Oakland in the coming years.